Havok is a middleware software suite developed by the Irish company Havok. Havok provides a physics engine component and related functions to video games. On September 14, 2007, Intel announced it had signed a definitive agreement to acquire Havok Inc. In 2008, Havok was honored at the 59th Annual Technology & Engineering Emmy Awards for advancing the development of physics engines in electronic entertainment. On October 2, 2015, Microsoft announced it had acquired Havok. Havok Physics: It is designed primarily for video games, and allows for real-time collision and dynamics of rigid bodies in three dimensions. It provides multiple types of dynamic constraints between rigid bodies (e.g. for ragdoll physics), and has a highly optimized collision detection library. By using dynamical simulation, Havok Physics allows for more realistic virtual worlds in games. The company was developing a specialized version of Havok Physics called Havok FX that made use of ATI and NVIDIA GPUs for physics simulations; however, the goal of GPU acceleration did not materialize until several years later. Havok AI: In 2009, Havok released Havok AI, which provides advanced pathfinding capabilities for games. Havok AI provides navigation mesh generation, pathfinding and path following for video game environments. Havok Cloth: Released in 2008, Havok Cloth deals with efficient simulation of character garments and soft body dynamics. Havok Destruction: Also released in 2008, Havok Destruction provides tools for creation of destructible and deformable rigid body environments. Havok Animation Studio (discontinued): Havok Animation Studio is formally known as Havok Behavior and Havok Animation. Havok Behavior is a runtime SDK for controlling game character animation at a high level using finite state machines. Havok Animation provides efficient playback and compression of character animations in games, and features such as inverse kinematics. Havok Script (discontinued): Havok Script is a Lua-compatible virtual machine designed for video game development. It is shipped as part of the Havok Script Studio. Havok Vision Engine (discontinued): On August 8, 2011, Havok announced their acquisition of German game engine development company Trinigy and their Vision Engine and toolset. Breath of the Wild uses the Havok Physics, Havok AI and Havok Cloth. Used in shrines and the field sections. Havok files serve as a data container for multiple Havok classes per file and sometimes multiple Havok files per file. The class names are defined in each file. The classnames section (__classnames__ internally) contains a list of Havok classes used by the file to correctly decompile the binary data into a usable data structure. The types section (__types__ internally) does not appear to be used by Breath of the Wild. the data section (__data__ internally) contains binary data to be serialized into Havok data structures for use by the Havok engine. The header seems to have a 16-byte alignment and can be 64-bytes (short header) or 80-bytes (long header) in length, depending on if Unknown 13 equals 0 (short header) or 16 (long header). There are optional header bytes for a long header. If Unknown 13 equals 16, an additional 16 bytes are added to the header for a total of 80 bytes. Each section has a 64-byte header which includes the section name, absolute offset to the section start and six relative offsets to segments within the section. All three section headers follow the file header and are delimited by 16 delimiter bytes (0xFF). There are only three section names: __classnames__, __types__ and __data__. The section name is a null-terminated string with a delimiter byte (0xFF) in byte 20. The absolute offset to the section. The relative offsets point to different large structures within the section. 00 00 00 FF 00 00 01 60 00 00 3C 00 00 00 3C 10 | .......`..<...<. The section name is __data__. The absolute offset is the beginning of the data section, right after the class names. 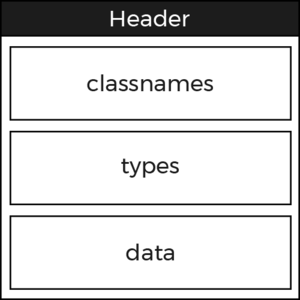 The classnames section header includes the absolute offset to the class names data and a single unique relative offset to the end of the section. The section is made up of an array of hash ids and a null-terminated string class name. Class names are read until the end of the section or a delimiter byte (0xFF) is is reached. The types section is unused in Breath of the Wild. The absolute offset points to the beginning of the data section with all null (0x00) relative offsets. The bulk of the file is devoted to the data section which is divided into smaller segments dependent on the file type. All files follow a general structure as you can see in the picture. Right after the header begins the data section which contains multiple chunks, luckily, the first four chunks are always the same. After that, several more chunks can be found depending on the file. The next section, at the end of the file, contains three different pointer arrays. It is used to connect the whole file together, and should be used as an entry point while reading the file. The offsets to these three sections can be found in the header. An array of offsets relative to the beginning of the data section, pointing into various chunks. Which offsets ends up in this list, depends completely on the chunks used in the data section. However, since the first four classes are always the same, the first 14 offsets will be the constant. Contains pointer-pairs to connect chunks together. To connect a chunk with another, a base pointer somewhere inside the base-chunk (depending on the class/type) is used as the first pointer. Then, the target pointer is the offset of the beginning of the target chunk. The last section contains the mapping between the chunks and the classes they are using. To link a chunk to a class, the data pointer is set to the beginning of the chunk. The class pointer is set to the first character of the class name found in the header section. This also marks the end of the file, if the offset is not aligned to 16 bytes, the rest is filled with 0xFF. ↑ Static Compound files (hksc) include two Havok file definitions. 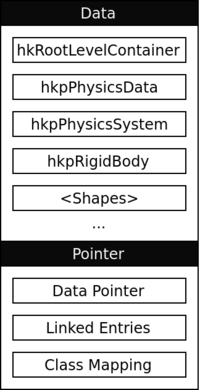 The first file defines StaticCompoundInfo and the second defines hkpPhysicsData (which includes hkpRigidBody, hkpStaticCompoundShape, hkpBvCompressedMeshShape, hkpConvexVerticesShape, et. al.). ↑ It is assumed to be a delimiter between the id and the class name string. However, 0x09 is also the tab character and could imply something to the engine. This page was last edited on 19 February 2019, at 22:04.